If you've ever wanted to learn how to bake your own bread at home, Rhiannon Abbott at The Epsom Bakehouse runs courses that range from an introduction to breadmaking to starting your own microbakery. Find out more on The Epsom Bakehouse's page. 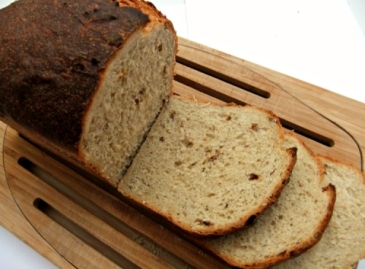 This Real Bread Week why not try your hand at making your own loaf? Rhiannon Abbott from The Epsom Bakehouse uses her favourite malted flour in this simple Real Bread recipe, and suggests adding in seeds (pre-soaked in water) for added crunch. Mix together the flours, yeast and salt into a large mixing bowl, avoiding direct contact between the salt and yeast. Pour in the water and mix together until no dry flour remains. Turn the dough out of the bowl onto a clean, un-floured surface. Knead for 10 minutes, or until it becomes smooth and elastic. The dough will be quite sticky to start with but keep going! Shape the dough into a rough ball and place it back into the bowl. Cover the bowl and leave the dough to rise for 1 – 2 hours or until it has doubled in size. Turn the dough out of the bowl and gently deflate it by kneading it for a minute or two. Turn the oven on at 230C and grease a 900g/2lb loaf tin. Shape your loaf. Flatten the dough slightly into a rectangle, then roll this up, tucking the ends in and under and ensuring the roll is the length of your tin. Place the shaped dough seam side down into the greased tin and cover. Leave to rise again for 1 hour, or until at least doubled in size. Bake your loaf in the pre-heated oven for 30 minutes, until well risen and a deep golden brown. The loaf should sound hollow when tapped on its base. Cool the loaf before enjoying.